After a few months off in which we made some spoons, planned and implemented a few Goodleaf things and had a bit of winter sun, we’re back! The Island is a great place to head If you want to start your outdoor adventures as early as possible in the year. Spring on the Isle of Wight seems to come earlier on the Island and it’s well know on our small island that the Isle of Wight is one of the sunniest places in Britain. FACT. The amazing natural landscape of the Isle of Wight offers plenty of different opportunities to get outside in spring. Yes, we know a walk is often met with moans and eye rolls from younger family member, but bribery in the form of cake or a picnic at the end can encourage the most stubborn non-walker. A favourite of ours is to walk to Quarr Abbey from Ryde. The route runs from quiet urban (urban for Ryde that is) streets, down footpaths, past ancient ruins, through woods and ends up in the grounds of a working monastery. With it’s own fabulous tea room. If you need something stronger than tea at the end of your walk, keep going for another 10 minutes and you’ll discover The Fishbourne. This route is also great if you’re on bikes. We recommend trying out some of the various off road cycle paths on the Island. A fun way to start is to take your bike on the Island Line train (vintage 1930s tube trains anyone?) and head down the Red Squirrel Trail towards Newport – the route even has its own café right on the cycle path. We're going with #optoutside today. How about you? Although the Isle of Wight is known for its amazing beaches, the woods are pretty fantastic too and can give you a real sense of isolation from hectic modern day bustle. You’re never far from anywhere on the Isle of Wight though. In spring time the woods are filled with abundant woodland flowers – bluebells, primroses and wild garlic. We recommend Borthwood Copse or America Woods to get your top up of springtime shinrin-yoku or ‘Forest Bathing’. In late spring we’ll start our family Woodland Adventures near America Woods in private woodland near Shanklin – you can read more here. 15th season of tree climbing! We’re proud, delighted, thrilled and to say that the end of March was the start of our 15th season tree climbing on the Isle of Wight. We’re open from the 30th March until the end of October 2019. 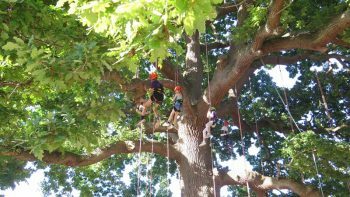 We’ve loads planned for 2019 – some old favourites like Cowes Week Tree Climbing and Essential Recreational Tree Climbing and some new things like Autism Friendly Climbs. We’ll be back at The Big Feastival and the Leicestershire Countryside Show over the August Bank Holiday Weekend and our Matt is also leading walks for this year’s Isle of Wight Walking Festival. If you’d like to keep up to date with what’s happening at Goodleaf (and get a special discount code) this season, please do sign up for our newsletter. We aim for one newsletter a month, but the reality is often fewer! Welcome to spring on the Isle of Wight.